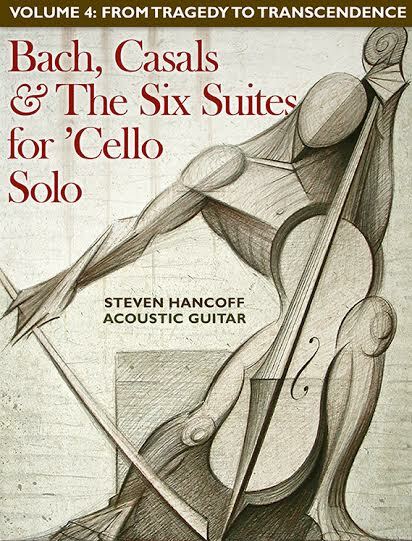 Acquired CD set By: I was selected to be a part of the blog tour for “Bach, Casals & The Six Suites for ‘Cello Solo: Volumes 1-4” hosted by iRead Book Tours. I received a complimentary copy of the CD set Volume 4: From Tragedy to Transcendence direct from the author Steven Hancoff without obligation to post a review. I did not receive compensation for my opinions or thoughts shared herein. I have a secret in my closet. A secret instrument to be exact! When I was six and twenty I made the bold choice to purchase a wicked stellar electric guitar – it’s in a lovely deep crimson red colour and has a lovely strap that is super comfy against my shoulder. I have an equally delightful amp that has yet to emerge out of it’s box! What pray tell would prevent me from picking up said guitar and amp whilst curating my own musical styling? Apparently the absence of an open-minded community for left-handed guitar players! No. Seriously. I couldn’t find one instructor who would teach me to play whilst accepting the fact I play left-handedly despite the fact I’m predominately right-handed. Clearly my community is overlooking the obvious: left-handers rock the music world! (i.e. I loved watching Josey Scott playing alongside Chad Kroeger for “Hero”; wave your hands fellow Spider-Man fans of the films with Tobey Maguire!) This guide to left-handed musicians should be passed out in pamphlets round here! This curious fact stems out of my dyslexic past and a sombering story of pre-school choices – none of which is relevant except to say I also play baseball left-handed! Yes, you read that right *baseball! * not softball! I digress. I’ve been an appreciator of classical music and classical compositions since I was quite young as I cut my teeth on Bach, Beethoven, Mozart and Tchaikovsky (clearly my passion for the 1812 Overture was a precursor to a life-long passion for devouring war dramas?) – whilst appreciating contemporary symphonies and orchestras. I loved attending musical concerts and developed a passion for soundcapes lateron as I developed my writing style, as I found the evocations of ambient and trance electronica created this ethereal creative well of inspiration. One of my favourite outlets for these soundscapes is Hearts Of Space, whose programmes are a feast of a writerly soul! Originally I listened to them on the radio until their station dissolved and I re-found them online in 2014! If you can find music that allows your mind the ability to relax into your creative synergy, it’s something to hold onto as creativity is quite obtuse at the best of times! Although being an electric guitar owner goes a bit against the principles of acoustic guitar sessions (as the whole point is to be ‘unplugged’ rather than ‘plugged’ in) — I must admit, I like finding ways to bridge gaps and musical styles; including finding a balance of pause between electric and acoustic techniques. Rebel musicians like David Garrett (info on the album I own of his via Wikipedia) truly inspire me, as who knew you could emote such a wicked sweet sound out of a violin, such as he? I’d love to learn classical guitar techniques prior to cutting into a vein of style that befits my eclectic personality as I am duly passionate about classical opera as much as the rock operas of Broadway musicals! I am happily eclectic by musicality too, as my heart thunders into a rhythm of joy whilst I listen to Indie artists (especially the kind found on CDbaby!) whose vibes are their own niche of musical revolution. I can take-on quite a heap of music and find the beauty of all of it – combined or singularly separate. Even the decades of the past are a vortex of inspiration as I can hunker down inside the early 20th Century alongside Cole Porter, Bing Crosby, Irving Berlin, George Gershwin, and the legends of Jazz. Swinging back into the classics for a moment, there is something quite tangible about the music of Bach’s generation – it’s not only dimensional, it’s thought-provoking. It’s invigorating but it’s emotionally connecting to you on a level only music can penetrate. Rather than focus solely on the musical notes and experiences of listening to this collection on CD – I wanted to step inside the booklet itself, and relate to you what I found about about Bach directly! A notation on the Cover Art: Being a visual artist who wants to take up sketching and illustration in the future, I couldn’t help but notice the beautiful etchings of the drawings being featured as the cover art design. It’s such a creative way to tell a short story about how man and music can blend together to create a harmony of a new class of dimension that it’s hard to see where man begins and music ends or rather, how the circle is so finite and conjoined the two become entwined. The sketching also focuses on the ‘fundamentals’ of the human form, and thus, seemed to tip the nod to working on the fundamentals of the crafting of musicality. To encourage practice out of the pleasure of developing the ear for what music can give you as much as what you can give back to the process. Published by Out of Time Music Co.